• Seven silence-optimized fan blades with high airflow capabilities reduce noise-generating turbulences while increasing air pressure. • Very quiet operation even at maximum speed, with noise of 19.6dB. • Pulse Width Modulation (PWM) allows compatible 4-pin controllers (including those built into many motherboards) to intelligently vary the speed (and thus the noise level) of the fan. • With PWM your system can ramp up the cooling when it’s needed, or operate in maximum quiet mode when it’s not. • Perfect choice for home and office PCs, gaming and multimedia systems. • Especially recommended for use in water cooling and CPU cooling builds. • High-quality rifle bearing technology contributes to a very long lifespan of up to 80,000 hours. 92mm be quiet! 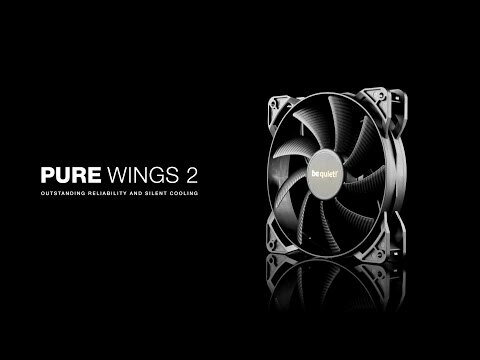 Pure Wings 2, 7 Blade, PWM, Airflow/Pressure Fan, 1900rpm, 33.15CFM, 19.6dB, Rifle Bearing, Black, 1x4pin is rated 5.0 out of 5 by 2. Rated 5 out of 5 by jonnyjay from Exactly as I expected from be quiet! Exactly as I expected from be quiet! it took 5 minutes to fit this as a replacement in a Synology DS216j, is near-silent in operation, and there have been no incidents reported by DMS in the first weeks. Good product and the usual good service from Scan. Rated 5 out of 5 by Gareth77 from Quieter than I expected I was uncertain if the fan would be quieter than the fan I had installed when it was working (bearing going and making a rumbling noise and vibration). However, pleasantly surprised and working well so far. Slower fan speed than the one previously installed but appears to do the job. Hey, its just a fan after all!